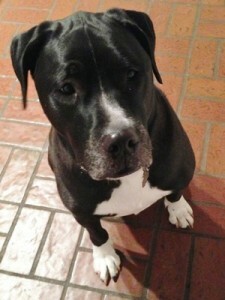 As you may or may not know, earlier this year the Accidental Locavore rescued a dog. He’s a big sweetie named Rif and like most dogs, will do almost anything (like obey) for a cookie. So when my friend Zhu Zhu had a recipe for dog biscuits in a recent newsletter and I happened to have all the ingredients on hand, Rif was going to get some homemade treats. This made about 50 4” bones and took about 45 minutes to get them into the oven. These will keep for a month in a covered container. 13 ounces chicken livers, cut into 1/2-inch pieces. Heat oven to 250°. Take two sheet pans and line them with Silpat or parchment. In a frying pan over medium heat, add the bacon. Cook until the fat is rendered and the bacon is a rich golden brown color. Pour off most of the fat, leaving a thin film in the pan, and add the chicken livers. Cook for about 5 minutes, turning them often and smashing them a little, until they are broken down, almost a paste, and cooked all the way through. Put the bacon in a food processor, pulse a few times to grind, then add the livers, pulse to combine, add the cornmeal and run it until you have a coarse mix. In a stand mixer with the paddle add the cornmeal, bacon mix and the flour. Mix it to combine. Slowly add the chicken (or beef) stock and mix until the dough begins to gather around the paddle. It should feel moist to the touch. Remove and knead it just enough to combine it all. Place between two pieces of parchment or plastic wrap and roll it out to about 3/8” thick. Cut out the bones and place them on the lined sheet pans. 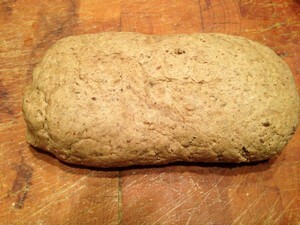 Knead the trimmings back together and roll them out to use the entire mix. Bake until ‘bone’ dry. It will take 3 hours in a standard oven, 1 1/2 in a convection oven. To make the glaze: combine the ketchup and egg whites, this will be quite thick. Brush it over the treats while they are still warm. Return to the oven and bake for another 20-30 minutes, until the glaze is set. Place the pans on a cooling rack and leave for 5-10 minutes, then transfer the treats to the racks to cool completely. Serve and let “Fido” enjoy! He also calls for a 2 5/8” dog bone cookie cutter. Rif is a big boy so I got a set from Amazon, that had a variety of sizes, depending on the size of your dog (and how big you like the cookies to be). Time to start saving more bacon ends and chicken livers – these biscuits won’t last more than a week or two! 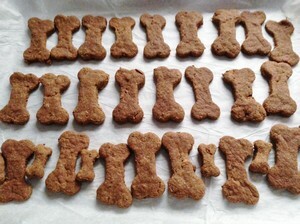 I used to make my dog’s treats while he was still around. I loved doing it and I know he loved that I did too! Previous post: Gabriel Rucker at DeGustibus: Food & Fun!